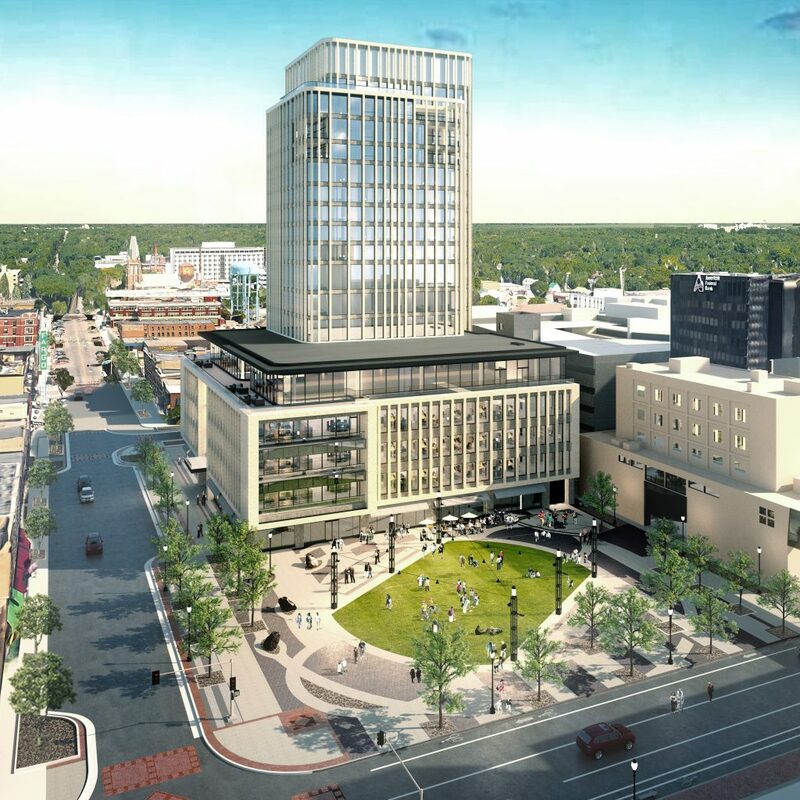 Kilbourne Group is pleased to announce Aparium Hotel Group as the hospitality management partner for the to-be-named hotel and restaurant within Block 9, an 18-story mixed-use development located on the corner of Broadway and Second Avenue in downtown Fargo, N.D. Known for creating one-of-a-kind, hyper-localized hotels and restaurants around the country, the Chicago-based hotel group will oversee operations for the hotel and food and beverage components, as well as lead the charge on the branding, programming and positioning of this highly anticipated development. Kilbourne Group, a Fargo real estate development company specialized in historic renovation and urban infill projects, has brought together an extensive array of partners and investors to create a signature project for Fargo in its historic center that adds to the city’s vibrancy and creates new uniquely-Fargo experiences. 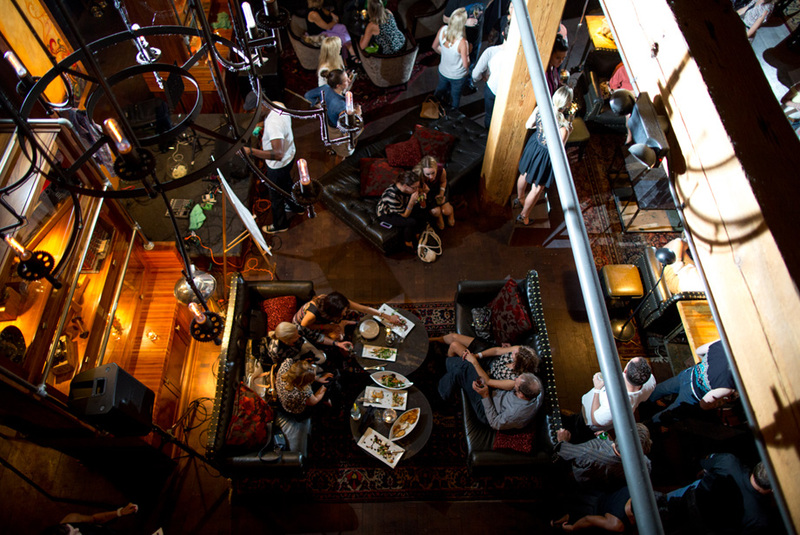 The lobby bar of the Iron Horse Hotel by Aparium in Milwaukee, Wisconsin. What is now a surface parking lot along Broadway, Block 9 will be home to a ground-up, mixed-use development, which will serve as a new headquarters for R.D. Offutt Company. Block 9 will host 110 hotel rooms across five floors as well as a ground floor flagship food and beverage venue. True to Aparium Hotel Group’s signature style and anchored in its “translocal hospitality” concept, the hotel and restaurant will be constructed and programmed with local influences to best capture the spirit of Fargo and engage with the greater community. Upon completion, the Block 9 development will also feature multiple meetings and events spaces, condominiums with sweeping views of downtown, Class A office space, additional ground floor retail, and an expansive, open-air public plaza that will be programmed year-round with exciting events, concerts and celebrations for locals and visitors alike to enjoy. The development is expected to break ground in 2018 and debut in 2020. For more information on Aparium Hotel Group, please visit www.aparium.com. Founded in 2011, Aparium Hotel Group is a Chicago-based, leading lifestyle hotel company owned and operated by industry veterans accomplished in hotel development, management and marketing. Aparium Hotel Group’s growth is guided by its “Translocal Hospitality” philosophy, which is the belief that great hotels are a destination sought out by travelers and a place that thrives as a gathering hub for locals. Adept in both adaptive reuse projects and ground-up developments, each of Aparium Hotel Group’s properties are independent brands and celebrate the specific neighborhoods and unique history of the distinct cities in which they reside. Aparium Hotel Group currently operates ten highly distinctive hotels across the United States with eight new projects in various stages of development. For more information about Aparium Hotel Group, please visit www.aparium.com. Kilbourne Group was founded in 2006 as a catalyst for revitalizing downtown Fargo’s urban core and economic vitality. Kilbourne Group has invested in mixed-use redevelopment and infill projects in downtown Fargo, designed to create a vibrant 18-hour city that offers unique experiences and places designed for people. Today, downtown Fargo is thriving with a retail district of more than 300 unique retail stores, more than 2,400 apartments, and more than 2 million square feet of office space. With proven expertise in urban development, fund management, real estate, construction management, and property management, Kilbourne Group is guided by the knowledge that vibrant downtowns create smart, healthy cities. Learn more at KilbourneGroup.com.